Over half a billion people in the world rely on sorghum as a dietary mainstay and, given its diversity of uses, as an important source of income. The grain is used mainly for food by many poor people and stalks is a vital source of fodder for livestock. Sorghum is also used for a wide range of industrial purposes. Sorghum grain is nutritious. It has relatively high levels of iron and zinc and can be used to complement global food. Sorghum grows over a wide range of temperatures and elevations. 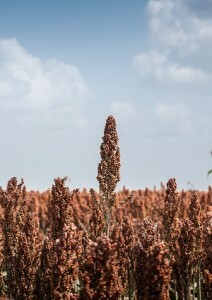 Given that sorghum requires less water, it is usually grown instead of maize in the hotter and drier areas of Africa, South Asia, and Central America. This hardy crop is now grown on some 42 million hectares in countries spread across Africa, Asia, Oceania and the Americas. In India, it is grown on 8.02 M ha with an average productivity of 920 kg ha−1. In West Africa, Nigeria is the largest producer of sorghum followed by Burkina Faso and Mali. In Mali, it is grown on 1.06 M ha with an average productivity of 1020 kg ha−1 (mean of 2006–2010 production data, FAO 2012). Major biotic constraints for sorghum production include shoot fly, stem borer, head bug and aphid insect pests; grain mold, anthracnose diseases, and leaf blight and weed competition and (in Africa) the parasitic plant Striga spp. Major abiotic stresses are drought, high temperatures, acid soils and low soil fertility. Many of these constraints will further intensify with projected climate changes and will have even more negative effect on productivity, especially drought and high temperatures in the arid and semi-arid regions. Changes in rainfall coupled with a rise in temperature with climate change may also reduce the length of the growing period (LGP) as determined by the duration of soil water availability. Therefore, it will be important that the maturities of crops match the periods of water availability to achieve higher and stable yields. In the semi-arid tropics where sorghum is currently grown during the rainy season, the mean crop-season temperatures are already close to or above these optimum temperatures. However, increased CO2 concentration in the atmosphere could have beneficial effects on crop growth, and could partially negate the detrimental effects of rising temperatures depending on the degree of the temperature rise, and the extent of crop transpiration reductions under elevated CO2. Based on the meta-data analysis, Knox et al. (2012) assessed the impact of projected climate change by 2050s on sorghum productivity for both Africa and South Asia. They reported 15% decrease in sorghum yield across Africa and 11% across South Asia. Therefore, suitable technologies need to be developed and implemented to cope up with future changes in climate in the developing countries.